Birthplace : Kettering, Ohio, U.S.
Aaron James "A. J." Hawk is an American football linebacker for the Green Bay Packers of the NFL. 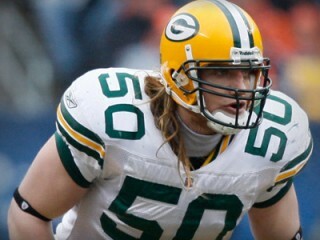 • Has either led the team or finished second in tackles in each of his four seasons in Green Bay. • Hasn’t missed a game in his career, playing in all 64 contests with 62 starts. The only two non-starts came in both Minnesota games in ’09 when Packers opened in nickel defense. • One of only 10 NFL linebackers to record at least 85 tackles, two interceptions and a sack in 2009. • Led the team in tackles as a rookie in 2006 with 155, second most ever recorded by Green Bay rookie (Rich Wingo, 166 in 1979). His 112 solo stops were third best in the NFL among all players that year. • Finished third in NFL Defensive Rookie of the Year voting and earned a spot on Pro Football Weekly/Pro Football Writers Association All-Rookie Team. • First linebacker drafted in the top five of the NFL Draft since Washington chose LaVar Arrington No. 2 overall in 2000; one of only 27 linebackers selected in the top five since the 1970 league merger. • A consensus All-American both as a junior (2004) and senior (2005), earned first-team All-Big Ten honors in each of his three seasons as a starter. Also captured the 2005 Lombardi Award, given annually to the nation’s top lineman or linebacker. • Nicknamed ‘A.J.’ by his parents, fans of legendary Indy car driver A.J. Foyt. • Grew his hair long in 2005 as a tribute to the late Pat Tillman, the former NFL player who lost his life with the U.S. Army while serving in Afghanistan. Reliable, assignment-sure defender entering his fifth season, having played in all 64 games with 62 starts in his first four years following selection as a top-five draft pick... Has either led the team in tackles or finished second in each of his seasons in Green Bay... Has posted 492 tackles (347 solo), 8½ sacks, five interceptions, 20 passes defensed, two forced fumbles and three fumble recoveries during his career... Despite seeing his snap count go down in 2009 compared to his first four seasons because of the Packers’ frequent use of sub-packages, was one of only 10 linebackers in the NFL to post at least 85 tackles, two interceptions, and a sack... The two interceptions matched his career high... Played the ‘Buck’ inside linebacker position in the Packers’ 3-4 base defense in ’09... In 2008, played through chest and groin injuries to lead the Packers in tackles for the second time in his career after moving from weak-side to middle linebacker the second half of 2008 to replace injured Nick Barnett... His team-leading 155 tackles in 2006 were the second most ever recorded by a Packers’ rookie (Rich Wingo, 166 in 1979), and his 112 solo tackles ranked third in the league... Finished third in The Associated Press Defensive Rookie of the Year voting, and earned a spot on the Pro Football Weekly/Pro Football Writers Association All-Rookie Team... Also named the team’s Defensive Rookie of the Year... The first linebacker taken in the 2006 draft after being a consensus All-American each of his final two seasons at Ohio State... One of only two linebackers taken among the top five selections over a period of nine NFL drafts (1998-2006), joined LaVar Arrington (No. 2 overall, 2000) in an exclusive group... Followed the likes of Lawrence Taylor (1981), Derrick Thomas (1989), Junior Seau (1990) and Willie McGinest (1994) as one of only 27 linebackers drafted in the top five since the AFL-NFL merger in 1970... Despite fielding a few attractive offers to move from the No. 5 position, GM Ted Thompson kept the pick, and the player he had targeted with that selection from the beginning was still there... When Thompson (a former linebacker himself) drafted Hawk, unlike most of the other high-profile selections, the linebacker wasn’t dressed in a suit at Radio City Music Hall to shake hands and pose with Commissioner Paul Tagliabue on national television... Instead, the humble All-American had declined the league’s invitation in order to share the moment with his friends and extended family in his native Ohio... That move was no surprise to those who knew him, because humility had defined Hawk since his days at Centerville (Ohio) High School, when he instructed his parents not to cheer for him and he never wore his high school varsity jackets to avoid coming across as “big-time”... In college, was always at his best in the Buckeyes’ biggest games... In just one game against eventual national champion Texas in 2005, induced QB Vince Young into two and nearly three turnovers with an interception, fumble recovery, sack, and another forced fumble... Twice started in the Tostitos Fiesta Bowl (2003, ’05 seasons) and each time earned the contest’s defensive MVP honors; also played as a reserve in the Fiesta Bowl, when Ohio State claimed the national championship for the 2002 season... Didn’t expect to be drafted by the Packers, but along with his family hoped Green Bay would be his destination because it most resembled his Midwest roots, a smaller town with ardent fans and outstanding tradition, like Columbus, Ohio. Played in all 16 games for the fourth straight season with 14 starts at ‘Buck’ LB... His only non-starts came in both Minnesota games when the defense opened in nickel... Also played in playoff game... Selected as a Pro Bowl alternate... Finished second on the team with 87 tackles (70 solo) and led Green Bay’s LBs with two INTs, which matched his career high... Added a sack, four passes defensed, and two tackles on special teams... At St. Louis (Sept. 27): Led team with season-high 11 tackles (seven solo)... At Minnesota (Oct. 5): Had his streak of 51 consecutive games started snapped when team opened in nickel. Posted four tackles (two solo)... At Cleveland (Oct. 25): Led the defense with 10 tackles (eight solo), including a season-high three tackles for loss. Stopped RB Jamal Lewis for losses of 1 and 2 yards on runs, and brought QB Derek Anderson down for a 2-yard loss on a fumbled snap... At Tampa Bay (Nov. 8): Saw most significant action of the season to that point, playing in both the base defense as well as the nickel with Brandon Chillar (hand) sidelined. Posted his first sack of the season when he brought down QB Josh Freeman for a 7-yard loss at the Tampa Bay 3 midway through the second quarter. Finished afternoon with six tackles (five solo)... At Detroit (Nov. 26): Tied for team lead with 10 tackles (eight solo), including a stop of RB Kevin Smith for a 1-yard loss on third-quarter run. Started every game for the third straight season, playing through chest and groin injuries... Had nine starts at WLB and final seven at MLB, where he replaced the injured Barnett...Led team with 121 tackles (84 solo)...Led LBs and was tied for second on the team with 3.0 sacks...On the field for 869-of-1,050 (82.8 percent) defensive plays, most among the team’s LBs... Vs. Minnesota (Sept. 8): Started at WLB and led the team with season-high 12 tackles after missing final three preseason games with chest injury suffered in preseason opener vs. Cincinnati (Aug. 11). Wore a shoulder harness to help protect the injury...At Detroit (Sept. 14): Posted first two-sack game of his career and tied for team lead with seven tackles. On second sack, leaped over attempted block by Smith and brought down QB Jon Kitna . Started all 16 games (plus both playoff contests) at WLB and finished second on the team with 129 tackles (81 solo), adding one sack, one fumble recovery, one forced fumble, one INT and four passes defensed... Played 92.2 percent of the defensive snaps... Vs. Washington (Oct. 14): Made nine tackles (six solo), plus one forced fumble and one fumble recovery. In the first quarter, stripped the ball away from TE Chris Cooley (recovered by Cooley), and in the fourth quarter, dove on a Clinton Portis fumble that was knocked out by Atari Bigby . Started all 16 games and led the team with 155 tackles (112 solo), second most ever recorded by a Packers rookie (Rich Wingo, 166 tackles in 1979), and led LBs with 3½ sacks... Among all NFL players, only Houston’s DeMeco Ryans (126) and Chicago’s Lance Briggs (117) had more solo stops... Also notched a pair of INTs among nine passes defensed, forced a fumble and recovered two others... Was on the field for 995 snaps, or 95.3 percent; the Packers thus utilized the nickel package more than dime... Finished third in The Associated Press Defensive Rookie of the Year voting... Named to the prestigious Pro Football Weekly/Pro Football Writers Association All-Rookie team and won Diet Pepsi Rookie of the Week honors twice (Weeks 7 and 10)... At Detroit (Sept. 24): Recorded his first NFL sack, dropping Kitna in the fourth quarter... At Philadelphia (Oct. 2): Teamed with Aaron Kampman to sack Donovan McNabb; earlier, recovered a fumble inside the Packers’ 5-yard line (forced by Charles Woodson). Played in 51 games at Ohio State with 38 starts, collecting 394 tackles (196 solo), 41 stops for loss, 15½ sacks, seven INTs, 13 passes broken up, two fumbles recovered and three forced fumbles; also returned both a blocked punt and INT for TDs... A three-year starter (2003-05), earned first-team All-Big Ten honors each of those seasons... Available for every play during his college career, started his final 37 contests in consecutive fashion... Earned B.A. degree in criminology... Senior season (2005): Earned consensus All-America honors for the second straight year and won the Lombardi Award, given annually to college football’s most outstanding lineman or linebacker... Also finished as a finalist for the Bednarik, Lott and Butkus awards... The Big Ten’s preseason and postseason defensive player of the year and without question college football’s premier LB, also garnered defensive MVP at the Tostitos Fiesta Bowl... Started all 12 games and led the team in tackles for a third consecutive year, racking up 121 stops (69 solo); also posted team-leading totals in tackles for loss (16½) and sacks (9½) while adding one INT, three passes broken up, one fumble recovery and two forced fumbles... Paced a unit that led the nation in rushing defense (73.42 yards per game) and finished fifth in total defense (281.73)... In heartbreaking, early-season home loss to No. 2 Texas (Sept. 10), posted 12 tackles, picked off a third-down pass by Young to set up a FG, recovered Young’s fumble on the ensuing drive, and forced a late-game fumble from Young which the QB recovered; recalls the 25-22 setback as one of his most disappointing college memories... Notched season-high 19 tackles, one short of his collegiate best, vs. No. 16 Michigan State (Oct. 15) and posted a sack and forced fumble, plus returned a blocked punt 8 yards for a TD, vs. No. 25 Northwestern (Nov. 12)... Notoriously big in big games, closed his collegiate career helping OSU to 34-20 win over No. 6 Notre Dame in Tostitos Fiesta Bowl (Jan. 2); had 12 tackles (nine solo), 3½ stops for loss and a pair of sacks – both times dropping Brady Quinn, his future brother in-law... Junior season (2004): Entered as media’s preseason Big Ten Defensive Player of the Year... Started all 12 contests, collecting a collegiate-high 141 tackles (62 solo), en route to consensus All-America honors (Sporting News, The Associated Press, Walter Camp, Football Writers)... Also totaled eight tackles for loss, one sack, five passes broken up and a pair of INTs, while recovering one fumble and forcing another... In nine games, led the team in tackles, and had at least nine tackles in all 11 regular-season contests... Notched an astonishing 49 tackles over a three-game stretch, with 14 stops (four solo) at Northwestern (Oct. 2), a career-best 20 tackles (eight solo) – becoming the first OSU player since Chris Spielman in 1986 to reach that single-game mark – vs. No. 15 Wisconsin (Oct. 9), and 15 stops (eight solo) at Iowa (Oct. 16)... His acrobatic INT at Michigan State (Nov. 6) halted the Spartans’ final drive with OSU clinging to a 25-19 lead in eventual 32-19 triumph... Sophomore season (2003): Emerged as defensive pillar for defending national champions, leading team with 106 tackles (52 solo), earning first-team All-Big Ten honors in his initial season as a starter. Born Aaron James Hawk... Nicknamed ‘A.J.’ by his parents since birth, after legendary Indy car driver A.J. Foyt... Born in Kettering, Ohio... Married the former Laura Quinn, whose brother Brady was Notre Dame’s QB and a 2007 first-round pick by the Cleveland Browns... The couple wed prior to his first NFL training camp in a civil ceremony, then had a more traditional wedding ceremony in March 2007... Brother, Ryan, played quarterback for the Birmingham Steeldogs of Arena Football ‘2’ and played in college at Ohio University... High school: Lettered four years at Centerville (Ohio) High School, playing MLB, RB and QB... Also handled punting chores for two seasons, and served as place-kicker as a senior... Rated as the nation’s No. 30 MLB by Rivals.com, finished with 585 career tackles, including 142 as a freshman starter... Averaged better than 40 yards per punt as a senior... Didn’t attract great national attention mostly due to a knee injury that sidelined him much of his final season, limiting him to only 82 tackles... Also earned a pair of letters (as a freshman and sophomore) playing point guard on the Centerville basketball team... Community involvement: Joined the winning child at Valley View Elementary School for ‘Take a Player to School’ in 2009... Was also chosen by local McKinley Elementary student for ‘Take a Player to School’ day and spoke to students about health and fitness in ‘08... Also visited with local elementary students the past three years as their reward for participating in the Packers’ Women’s Association food drive... Has supported the Jerry Parins Cruise for Cancer, the Donald Driver Foundation, the Greg Jennings Foundation, the Al Harris Outreach Program and The 2nd & 7 Foundation, which is the charity of Chiefs LB and fellow OSU alum Mike Vrabel... Has twice been on the Buckeye Cruise for Cancer, which raises money for the The Stefanie Spielman Fund for Breast Cancer Research; Stefanie – who died of breast cancer in November 2009 after a 12-year a battle with the disease – is the wife of Chris, a former Ohio State and NFL star... Is a spokesman for the Wisconsin Special Olympics, a cause he takes particular interest in because a relative of his used to compete... Every year, attends the Wisconsin Special Olympics opening ceremony in Stevens Point, Wis. ... Hobbies/interests: Holds B.A. degree in criminology and is interested in law enforcement following his NFL career... Grew his hair long in 2005 as a tribute to the late Pat Tillman, the former NFL player who lost his life while serving the U.S. Army in Afghanistan... Maintains friendships with former Buckeyes Bobby Carpenter (St. Louis), Nick Mangold (N.Y. Jets) and Anthony Schlegel (formerly N.Y. Jets)... Has a weight room in his house... Threw out the first pitch at a Milwaukee Brewers game in April 2007; also took batting practice in full baseball uniform and hit two HRs.